1996 – July – Canada Rockies, Glacier National Park USA Montana. 1 July. Flew to Canada and met up with our group in Calgary, Alberta and stayed the night at the Westin Hotel, Calgary. The keys we were given led us to a room in darkness, because the curtains were closed. As I crossed the room to open them I realised it was occupied with a young couple in a rather intimate state, I began hastily to beat a retreat apologising profusely and was invited to join them! I/we didn’t and fled. Returned to the desk and got the correct keys. Funny start to the holiday. In consequence we arrived quite late for dinner. 2 July. Saw the young couple at breakfast; they waved, fortunately they were not in the group. We motored south through rich farmlands and some of the most beautiful mountain scenery anywhere in the world. We crossed the Peigan/Blackfeet Indian Reservation and where the foothills of the Rocky Mountains meet the Great Plains, we went to view the Head-Bashed-In Buffalo Jump. one of the world’s oldest, largest, and best preserved buffalo jumps. The Jump bears witness to a method of hunting practiced by native people of the North American plains for nearly 6,000 years. Apparently the bison were herded and stampeded in such a way that they fell to their deaths over this steep escarpment. A pretty grim start to the tour. We stopped and dined at the Prince of Wales Hotel, overlooking Waterton Lake. Waterton Lake forms part of the impressive Glacier National Park and is partially in Canada and partially in the USA. The extraordinary hotel dates from 1927 and is presumably named after the then Prince of Wales later the Duke of Windsor. Huge picture windows in all the public rooms. The views breathtaking. Looking back I can see that all the hotels where we either dined at or stayed were very luxurious. Someone in the party said that because Tauck Tours were such regular clients we were always given the best rooms available and as for the service and food. Before we hit the hotels, even if it was only for a meal, we were told there were x number of restaurants and the best of them (most expensive) was so and so and all we had to do was to tell the maître D that we were with Tauck and we would be given the best table available. There were no ‘group’ tables, you just went to eat when and with whom you wished. You could eat whatever you wanted and at the end of the meal, you simply signed Tauck Tours and Room number and staggered out having been served mountains of truly delicious food. Some people waded through the whole menu. After a couple of days we got together with a small group with whom we always dined. I don’t think William and I have enjoyed ourselves so much when dining. Everyone very witty and amusing and we spent as much time laughing as we did eating. We never had such a joyful experience like that on any of our trips. In fact we still write to two of the charming ladies who formed our little group. After lunch we crossed the border from British Colombia, Canada to Montana, USA. In what appeared to be the middle of a forest, the coach stopped outside a small wooden chalet – Passport Control – and the two of us, being the only Britishers aboard, everyone else being American, had to get off the coach and go into this small wooden hut and answer a series of questions, had our passports stamped, etc. All very pleasantly done, though he did look rather theatrically stern I think it was the biggest excitement the Passport Control Officer had had for a long time and he made the most of it. We seemed to have been kept for ages before being let back onto the coach. All very strange. Our destination was the Many Glacier Hotel, Montana, on the shores of Swift Current Lake. It was built like a large, very large, Swiss chalet surrounded by rocky mountains. The wooden panelled atrium of the hotel had an enormous fire in the centre which was surrounded by wooden balconies, straight out of a Western film. Our room all pine panelling. There was snow on the surrounding jagged rocky mountains the ground covered in wild flowers. Delicious dinner. 3 July. Coached out to Swift Current Lake for a cruise on the lake. We walked back to the hotel with three ladies in the party through woodland in which, we were warned, we could encounter bears! We didn’t. I think the white flowers below were called Bear Grass. Three of the ladies who joined us on our walk back to the hotel. We were told just whistle and make a noise if you encounter a bear ! After lunch we boarded open topped scenic coaches c.1930s. Fortunately the hoods were put back and we had a wonderful drive in the open air. We drove down the spectacular ‘Going to the Sun Highway’, skirting the shore of St Mary’s Lake crossing back into Canada over Logan Pass. No one checked our passports, so as far as the authorities are concerned we are still somewhere in the USA. Spectacular mountain scenery, glaciers and waterfalls, everywhere covered in gentian, heather, bear grass and glacier lilies. A memorable drive. We then descended to Lake McDonald and stayed the night at the Lake MacDonald Lodge. 4 July. Coach north into British Columbia along the eastern slope of the Canadian Rockies into the heart of western Canada’s great timberlands. Stopped for lunch at Fort Steele a historic ‘Heritage Town’. The town came into being in with the gold rush in nearby Wild Horse Creek in the 1860s. A John Galbraith provided a ferry service for prospectors across the nearby Kootenay River The town grew around the ferry and was called Galbraith’s Ferry. The name was later changed to Fort Steele. The gold ran out and then major deposits of silver, lead, and coal were discovered nearby and the town was flooded with prospectors once more. The town boasted 11 hotels at the peak of its prosperity. However, these deposits also ran out and the town was bypassed by the Canadian Pacific Railway and virtually died. Sometime in the 1950s it was revived as an historic visitor centre and is visited by thousands. All the old shops and houses have been frozen to the 1890s. We had a quite interesting wander around looking at the various stores and the forge and some of the houses. We had lunch there and continued into Kootenay National Park, passing the bright red walls of Sinclair Canyon and through Radium Hot Springs. Our room was luxurious, no other word for it and we occupied a room with a view right in the centre of the lake. Fabulous and memorable dinner with a lot of laughter. There was a small band playing and some people danced. I used to love dancing but somehow I did not think it was quite the place for ballroom dancing and I had just forgotten how to shuffle around the floor as seemed to be what people did nowadays. 5 July. We woke and watched the dawn rise from our bedroom window and then joined some of group who had come down to the edge of the lake. Spent the morning wandering about the grounds of the Chateau and then sitting looking at the lake and watching a million and one Japanese tourists being photographed in front of the Chateau. Apparently it features in a Japanese soap opera. Coach after coach of them arriving and having their photograph taken with a guy dressed in a kilt, whether he is a photographic model fixture or maybe it has something to do with the soap opera. Man in a kilt! In the afternoon we left along the magnificent Icefields Parkway. Our destination for the next two nights was the Jaspar Park Lodge, Jasper, Alberta, in Jasper National Park. 3,500 ft. high. The lodge consisted of the main Lodge and scattered all around it on the shores of Lake Beauvbert were small log cabins and we were allocated no.116. The cabin has a small lounge, bedroom and bathroom and very comfortable it was too. A Bald Eagle on a nearby tree. 6th July. We had a free day and someone organised a small private coach to take us on a trip through the park, our final destination being a boat ride on Lake Maligne. A really lovely day spent with great company. We have never laughed so much or felt so happy. 7 July. We travelled south to Banff. We stopped off at the Athabasca Falls. We then viewed Mount Edith Cavell to see the glacier. The Mount rises from the Athabasca River and Astoria River valleys in Jasper National Park. It was named in 1916 after Nurse Edith Cavell executed by the Germans during World War I for helping Allied soldiers escape from occupied Belgium. We went to the Colombia Icefields to visit the Athabasca Glacier. We were transferred to a specially constructed glacier vehicle which travelled some way up the glacier. We all got out of the glacier transport and tried not to slip and fall on the ice which reduced everyone to giggles. With Marilyn and Barbara on the Athabasca Glacier. We finished the day at the Banff Springs Hotel. Sumptuous. The Banff Springs Hotel was built during the 19th century as one of Canada’s grand railway hotels, constructed in the Scottish Baronial style and opened to the public in 1888. It was commissioned by the Canadian Pacific Railway. It was completely rebuilt in 1911. Our room was just luxurious. The food perfect. And the company was all we could ask for. 8 July. Day in Banff Springs. We were taken up by gondola to the top of Sulphur Mountain, one of the beauty spots. 7,500 ft.
We spent the afternoon wandering rather aimlessly round Banff. Nothing to see except the rather dangerous wild moose which were roaming the streets. We were told not to approach them as apparently they see off quite a few people each year. Returned to our beautiful bedroom. We had a farewell dinner at the hotel and said goodbye to the friends we had made and who had made the trip so enjoyable and funny. 9 July. We were coached to Calgary Airport for our flight home. October 1996 Italy, Castelfranco, Tiepolo in the Veneto exhibition in the Ca Rezzonico, Venice Palazzo Labia, Udine, Este, Montecchip, Maggiore Villa Cordellina Lombardi Villa Pisani. We took a Martin Randall tour entitled ‘Tiepolo’, one of our favourite artists. 23 October. Flew to Venice. From there we visited the Villa Valmarana ai Nani. What a start to our tour. The Villa Valmarana is a Venetian villa just outside Vicenza on the slopes of San Bastian. It is renowned for its magnificent series of frescoes by Giambattista Tiepolo and his son Giandomenico Tiepolo. The boundary wall is topped with stone sculptures of dwarves by Giambattista Bendazzoli based on drawings by Tiepolo, and the villa is still inhabited by the Valmarana family. How incredible it must be to live in such a magical place; my heart would quicken with every day I awoke. There are four great set pieces, one from Homer’s Illiad, the second from Virgil’s Aeneid, the third from Ariosto’s Orlando and the fourth from Tasso’s Gerusalemme liberate. The first, in the entrance hall, is The Sacrifice of Iphigenia. Iphigenia who is to be sacrificed for her father in order to appease the gods so that his ships can set sail for Troy. It shows the priest at the altar just about to stab Iphigenia to death, on the left is a deer hind attended by putti on a cloud just about to descend who have been sent by Diana to save her. Agamemnon her father is far to the right with his face covered. You slowly realise that the pillars through which you are witnessing the scene are in fact part of the painting as the cloud on the left and a hand of one of the spectators on the right are between you and the pillars. Diana and the wind god Aeolus are depicted on the ceiling watching the scene. Breathtaking. Love fulfilled and love requited fill the adjoining rooms. The story of Achilles unrequited love for the slave girl Briseis, and his ensuing rage, the requited love between Angelica and Medoro, the love story of Rinaldo and Armida and the doomed love of Dido Queen of Carthage for Aeneas. What a feast and we had hardly started our tour. We were served a delightful tea at the Villa. In a state of wonder set off for our hotel in Castelfranco which was to be our permanent home for the tour. The hotel was the Hotel Alla Torre, a luxurious hotel next to the town’s old clocktower and mediaeval walls. Our room even sported a delightful medieval mural. Dinner was excellent in the Ristorante alla Torre almost next door to the hotel where we had all our evening dinners. We knew that sitting in Castelfranco’s cathedral was Giorgione’s Madonna and Child with Saints Francis and Nicasius (formerly thought to be St George). 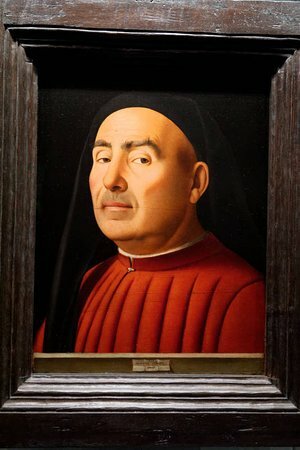 The altarpiece was commissioned by the condottiero Tuzio Costanzo in memory of his son Matteo, who died of a fever whilst serving Venice in 1499. In fact the face of St Nicasius is thought to be of Matteo. 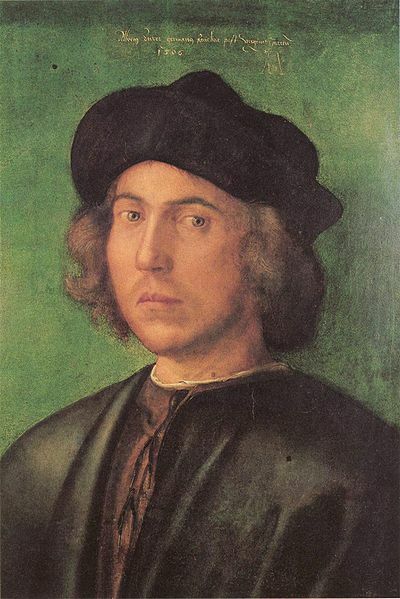 It was not on the itinerary and we were told because of our full schedule and services at the cathedral it was unlikely we would be able to see the Giorgione. Undeterred I found out when services were held and saw that we could just about sneak in before the service began, well before breakfast was served at the hotel. 24th October. We got up very early and rushed to the cathedral and in fact were able to see the Giorgione before the service began. Isn’t it magnificent? Word got around amongst the party that we had seen it early in the morning and I think that almost everyone on the tour made the pilgrimage the following morning. After breakfast we caught the train to Venice and walked to the Scuola Grande di San Rocco to see its Tiepolo paintings. One had been loaned to the exhibition in the Ca Rezzonico to which we were going the other was Abraham visited by the Angels. Abraham visited by the Angels by Tiepolo. The angels have come to tell Abraham that his aged barren wife Sarah will bear him a son. We then visited the Scuola Grande dei Carmini. Here we came to see the massive frescoed ceiling by Tiepolo. Being in such a room is one of the great thrills of my life. The central panel shows the Virgin bestowing on St Simon Stock, Prior General of the Carmelites, the scapular of Carmine which then became the emblem of the Order. Apparently he had this vision in England in 1251! The scapular formed part of the dress of the Carmelites and eventually consisted of two small panels of cloth worn over the chest and back. All very odd. Dotty it may be but isn’t it magnificent? This is only part of the central panel. The whole ceiling is covered by Tiepolo and is just a glory. Then on to the Ca Rezzonico to see the great Tiepolo Exhibition which was the highlight of our tour. What a feast. Masterpiece after masterpiece gathered from great collections from all over the world. It is impossible to choose any one to illustrate so I have chosen something that must have been close to Tiepolo’s heart, a charming portrait of his son Lorenzo. A rather gloomy affair. From there to the Palazzo Labia, from hell to heaven. What can one say about the glorious frescoes by Tiepolo in the Palazzo. Built in the 2nd half of the 17 century and home to the great Labia family and now sadly the headquarters of some radio station. It houses Tiepolo’s Anthony and Cleopatra masterpieces. If your jaw does not hit the ground on entering the room in which they reside I declare you dead. I could fill the next few screens with the main images and a mass of details. To finish this almost perfect day we visited the church of S. Alvise which contains three superb paintings by Tiepolo of the Passion – consisting of the Crown of Thorns, Flagellation and Christ carrying the Cross. Christ carrying the Cross – The Calvary by Tiepolo. One of the most moving paintings Tiepolo ever produced. With our heads reeling we returned by rail to Castelfranco and another marvellous dinner at the Ristorante alla Torre. 25 October. Taken by coach to Udine to see the 18th century Archiepiscopal Palace which is bedecked with frescoes by Tiepolo. 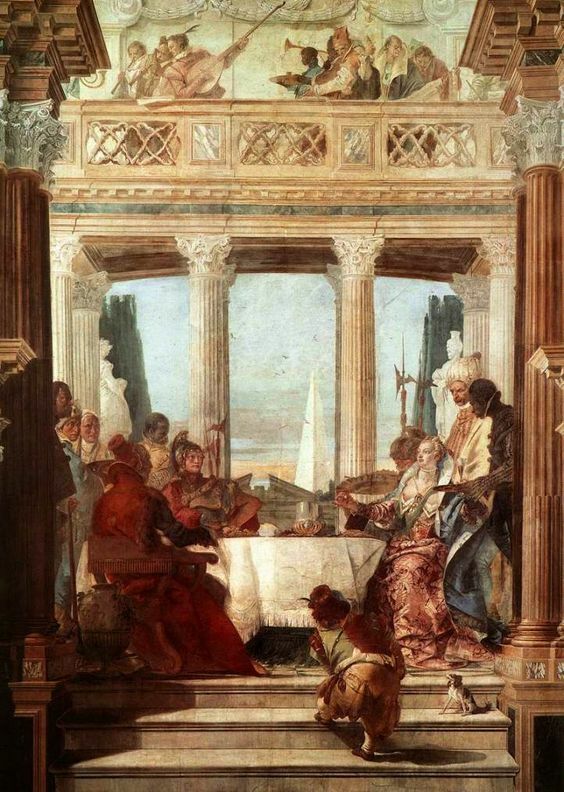 There is a great Judgement of Solomon on the ceiling of the Red Room but the set of frescoes in the galleria degli ospiti or waiting room, more a sort of corridor has some of Tiepolo’s great works. Altogether the palace has about 18 frescoes by Tiepolo. In my view the masterpiece is the Laban meeting Rachel and Jacob on the Mountain of Gilead. An odd little tale from Genesis. Rachel and her husband Jacob (one of the great Jewish Patriarchs but in my view one of the old Testament’s sly scoundrels) had stolen Laban, his father-in-law’s images of his ‘household gods’. The scene depicts Laban having caught up with the thieving pair and having searched the encampment for his property, is now speaking to Rachel. Unbeknown to him his daughter Rachel had stowed away the loot in some camel saddlebags and is sitting on them. She is informing him she is having one of her periods so her father does not ask her to move and so the thieving pair get away with poor old Laban’s ‘household gods’, whatever they were. Looking over the aged Laban’s shoulder is Jacob with a rather wry look on his face, this is, apparently, a self-portrait of Tiepolo. Our guide got very bashful when describing the scene to us. Laban meeting Rachel and Jacob on the Mountain of Gilead. One of the ceiling paintings The Sacrifice of Isaac by Tiepolo showing his great theatrical flare. The disposition of the legs of the angel and Issac, Abraham’s raised hand with the sword and that shaft of light and cloud. Breathtaking. After Lunch we took the most extraordinary long trip to Este to see the great Altarpiece of St Tecla in the Duomo. 26 October. Took the train to Venice and visited the Palazzo Pisani Moretta to see the Tiepolo ceilings which had recently been restored by the Venice in Peril Fund. The Apotheosis of Admiral Vettor Pisani. The Institution of the Rosary and St Catherine of Siena standing on the left, St Rose of Lima, standing on the right, holding the Christ child and St Agnes of Montepulciano seated. then coached to Stra to visit the Villa Pisani ‘La Nazionale. Lunch and then to Venice airport for our return home. 1997 May – Brittany, Rennes. 21 May. Coach to Portsmouth and then overnight ferry to St Malo. Dreadful cramped and musty cabin, we were awake most of the night and left the wretched dump at daybreak. 22 May, From St Malo we went by coach to Rennes to visit the Palais de Justice (1665) which was the former seat of the Breton Parliament and then to the Fine Arts Museum with paintings by Georges de la Tour. From there we went on to Carnac which is one of the main objects of joining this particular tour. The ‘Alignments of Carnac’ consist of some 2730 standing and fallen stones. The first ones were erected sometime in 2000 BC and stones kept being added right until c.750 BC. Quite extraordinary sight. No one really has a clue what they are all about. Sadly we were not allowed to wander about among them; a bitter disappointment. And as no one had been walking among them for some time the whole site was covered in weeds and looked quite dreadful. The whole place is awash with other alignments of stones. The Alignments of Le Menec, Kermario, Kerlescant, etc. Very strange. From there we visited the Grand Menhir and the burial chamber called the Table de Machands. The largest known Menhir (megalithic standing stone). It original height is estimated at 66 ft and weighs 350 tonnes. It it reckoned that it was to be the principal focal point related to all the other stones in the region. The interior. Within the burial mound are carvings of an axe and what appear to be ears of corn. Finally the Dolmen de Mane-Rutual. A rare double chambered passage grave. From there we went to Vannes a very attractive town where we were left to our own devises. Visited the cathedral and the Chateau Gaillard which is now one of the town’s museums. It was once the meeting place of the Rennes Parliament. Contains many of the prehistoric finds from Carnac and Locmariaquer and this incredible room called the Cabinet des Peres du Desert with painted panels c.1640. The chateau was built in the 15th century for Jean de Malestroit, Bishop of St-Brieuc and then of Nantes. 24 May. Coach to the walled town of Concarneau, Frances’s third largest fishing port. Very little of interest. Very touristy. Haven’t a clue why we visited the place. We then travelled along the Cornouaille peninsula the westernmost point in France with its wild and rugged coastline to Quimper where we stayed at the Hotel la Tour d’Auvergne. 25 May. Quimper. Visited the Musee des Beaux-Arts housed in one of the wings of the Town Hall. It was originated by a collection donated to the town by the comte de Silguy, and contains many Flemish, Italian and French works. Boucher, Fragonard, Oudry, Rubens, Reni. etc. I’ll just choose one of the French 18th century portraits. There isn’t a gallery anywhere that would not want to possess this. Visited the cathedral but it had clearly been despoiled during the Revolution and it did not seem that there was anything of any importance in it. Rather charmless. 26 May. Visited Locronan, delightful place, to see the church and visit the tomb of St Ronan an Irish hermit (9th century). The church of Locis also filled with a magnificent collection of naïve 16/17th century wood carvings. How they survived the destructive mob during the Revolution is a mystery. Very moving Deposition. There were many more such pieces. On to Pleyben, another delight. Here to visit the church and elaborate Calvary begun c.1550, also visited the ossuary which is late-Gothic. Then on to Morlaix. The place is dominated by a monumental two storey railway viaduct over the river. Beautiful half-timbered houses and a museum/art gallery. The so-called Maison de la Duchesse-Anne is open to the public, though apparently it is much restored. From there we motored to Roscoff where we were to spend three nights at the Hotel le Brittany, a Breton manor house hotel by the sea. 27 May. First we visited the Chateau of Kerjean. Built in the 16th century for the Barbier family one of whose members was at the time one of the wealthiest prebendaries in Brittany. It came into the hands of the state in 1911. It contains a beautiful chapel. Most of the rooms were empty but I understand that many are now furnished as a Breton museum. On to Bodilis to see the 16/17th century church. The church is renowned for the abundance of its carvings which somehow survived the Revolution. The polychrome statues of the apostles in the porch is only one of its great treasures. Bodilis. The sculptured porch (1631) this showing three of the apostles. Then on to Lampaul-Guimiliau. Has a quite plain calvary. The church is late Gothic church with again a finely-carved porch and a positive wealth of exceptional good sculptures. There is a wonderful and colourful rood screen (1679). and a very moving Entombment of painted stone dated 1676. One of the altars. 17th century. This charming one showing the tragic end of St Milau who is holding his head in his hand while out of his neck gushes blood like a fountain. He was beheaded by his brother in the 6th century. Next came Guimiliau. It sports one of the most elaborate of the cavalries we had seen so far. It is dated 1580s and is positively awash with as many figures and scenes from the life of Christ as could be accommodated. Only one of the crosses remains the ones with the thieves has disappeared. Of the three sets of porch figures we had seen, these was probably the finest. I wonder if the towns vied with one another to see who could produce the best porch carvings. and finally to the village of St-Thegonnec. A little known saint except he was a companion of St Paul. It boasts an Ossuary of 1675 which contains a magnificent Entombment of life-size figures in carved and painted oak (1699-1702) by the first named sculptor Jacques Lespaignol of Morlaix. by Jacques Lespaignol of Morlaix. 28 May. Roscoff, church harbour and town. Afternoon boat to nearby Ile de Batz. What on earth we were doing in Roscoff is anybody’s guess. Apart from the church having a confection of a bell tower there was absolutely nothing to see or do. And as to the Ile de Batz. There is nothing there. It’s flat and treeless and utterly uninteresting. The heat was intolerable and we felt we had wasted a whole day. Mary Queen of Scots landed at Roscoff on the way to marry the Dauphin and the Young Pretender disembarked here after fleeing the battle of Culloden. And those are the most interesting things about Roscoff. 29 May Visit Treguier, cathedral and cloister. The place had been hit by the Revolution and I suspect much was destroyed. All the many battered tombs seemed to have been lined up down the centre of the cloister corridors. Someone must have grabbed it and hid it from the destructive revolutionary mob. On our way to Dinan where we were to spend the night, we stopped off at the Gardens of Kerdalo, much to the annoyance of some passengers as we spent a great deal of time getting lost in the tiny lanes that led to it. Anyone expecting to visit Dinan our goal for the day was going to be disappointed. 1997 July – Genoa Turin. Did our own private trip. Some of the places we visited in Genoa. Cathedral of San Lorenzo. Romanesque, started to be built in the 12 century and modified in the 13th 14th century. National Gallery in the 16th century mansion Palazzo Spinola, when it was the property of the Spinola family in the 18th century and has four floors of paintings in sumptuous rooms, Guido Reni, Van Dyck, Rubens, Strozzi, etc. Palazzo Bianco, 16th century enlarged in the 18th century. Crammed full of masterpieces, Memling, Van Dyck, Rubens and Caravaggio. This the Caravaggio Ecce Homo. Palazzo Rosso. 17th century. Van Dyck,Durer, Guercino, Lodovico Caracci and Strozzi. Palazzo Balbi-Durazzo. Begun in 17th century and finished in the 18th century. Magnificent rooms, it was once the royal palace. 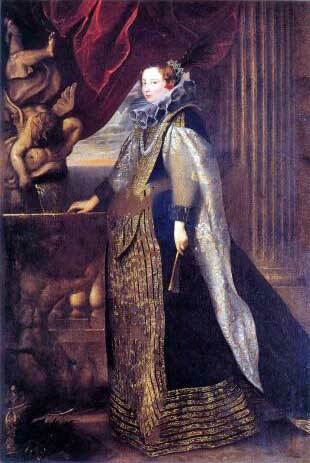 Again, Van Dyck, luca Giordano and Strozzi represented. Turin. The Civic museum and art collection sits in the Palazzo Madama15th – 18th century. Contain the royal apartments and a good collection of paintings. The Cathedral, Genoa, 15th century, of course boasts the Holy Shroud which resides in its own chapel. Two of the great museums in Genoa are the Egyptian Museum and the Galleria Sabauda. The exhibits in the Egyptian are supposed to rival Cairo and London. We were highly unimpressed. Full of noisy school kids rushing about which did nothing to help it. We did not stay long. The Galleria Sabauda was the highlight of our visit to Genoa. The collection was made by the princes of the House of Savoy, and is famous for its Flemish, Dutch and Venetian paintings. A marvellous Veronese romp – Oil being poured on Christ’s feet. 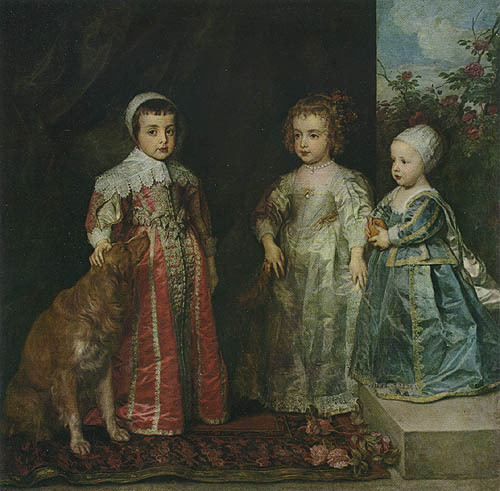 The children of Charles I by Van Dyck, gifted to the Savoy family by Henrietta Maria, which we found among the stored paintings. 1997. July. Isles of Arran and Bute. 30th July. Travelled from Euston to Carlisle and stayed at the Hetland Hall Hotel in Carrutherstown just north of Dumfries. 31 July. 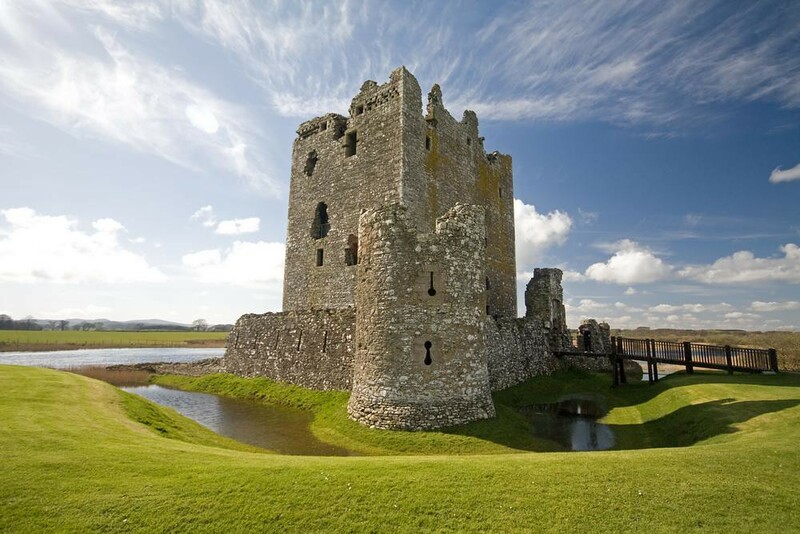 Visited Threave Castle built in 1369-90 for ‘Archibald the Grim’ 3rd Earl of Douglas who died in the castle in 1400. It was wrecked by the Covenanters in 1640. Then visited Threave Garden (National Trust for Scotland). On to Dumfries – statue of Robert Burns, – he lived here from 1791 till his death in 1796. He is buried in the mausoleum in St Michael’s Churchyard. 1st August. Visited Drumlanrig Castle (17th century) set in magnificent gardens one of the many homes of the Duke of Buccleuch and Queensberry. It is nothing less than a palace build in the late 17th century. Crammed full of magnificent paintings and furniture. Contains works by Rembrandt, Holbein, Murillo Reynolds and Ramsay to name just a few. Then to the Marine Highland Hotel at Troon. 2nd August. 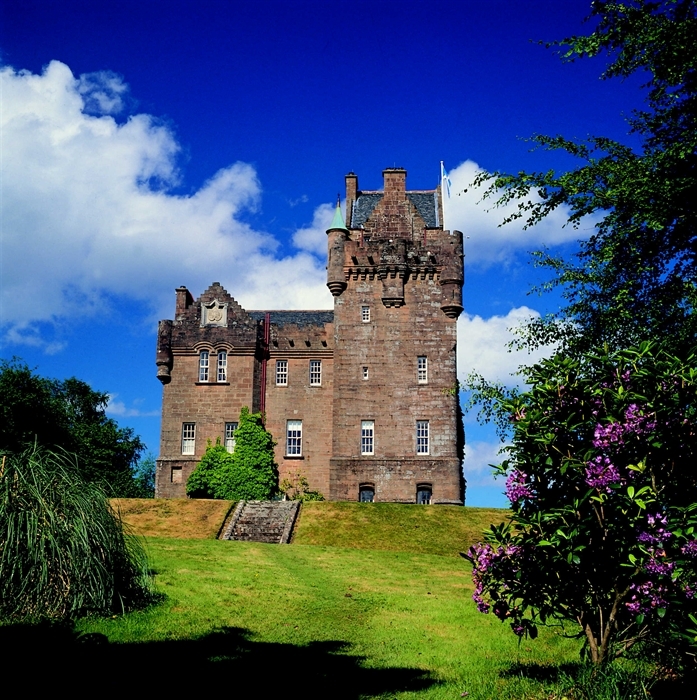 Travel to Ardrossan and then a ferry to the Isle of Arran to visit Brodick Castle. Another incredible collection of paintings. Back to hotel in Troon. 3rd August. Visit Burns Cottage at Alloway. The cottage is charming and is laid out as it would have been when Burns was a boy. Very good collection of portraits. Then to the Turnberry Hotel. In the afternoon visit Culzean Castle. 4th August. Coach to Wemyss Bay for the ferry to the Isle of Bute where we visited Mount Stewart House and Gardens. The original house was destroyed by fire in 1877 and rebuilt in the 1890s. Very, very fantastical Victorian Gothic. No expense spared. Rothesay Castle is in the principal town on the Isle of Bute, and has been described as one of the most remarkable in Scotland, for its long history dating back to the beginning of the 13th century, and its unusual circular plan. Then onto Glasgow where we stayed at the Moat House Hotel. 5th August. Returned home.